The White Carpathian Mountains in the southeast of the Czech Republic, Central Europe, host extremely species-rich grasslands. Unfortunately many of them were destroyed in the second half of the 20th century. Since 1990, however, a large area of arable land has been converted to grasslands, partly by applying a regionally produced seed mixture. The White Carpathian grasslands situated in the Czech Republic, Central Europe, belong to the most species-rich grasslands worldwide (Wilson et al. 2012) and harbour many rare and endangered plant and animal species, especially vascular plants and insects (Jongepierová 2008; Jongepier & Jongepierová 2009). 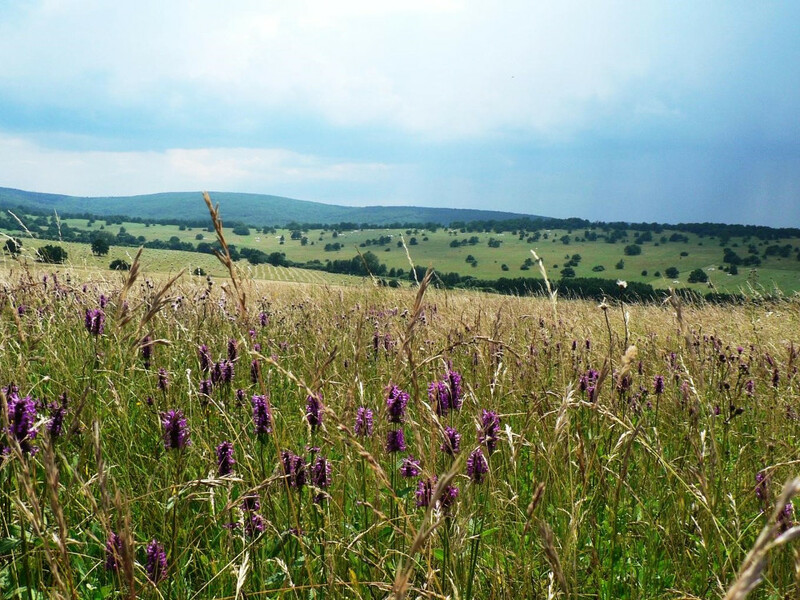 The current area of White Carpathian species-rich grassland sites amounts to 4,000 hectares (15.4 sq. mi). Fig. 1. 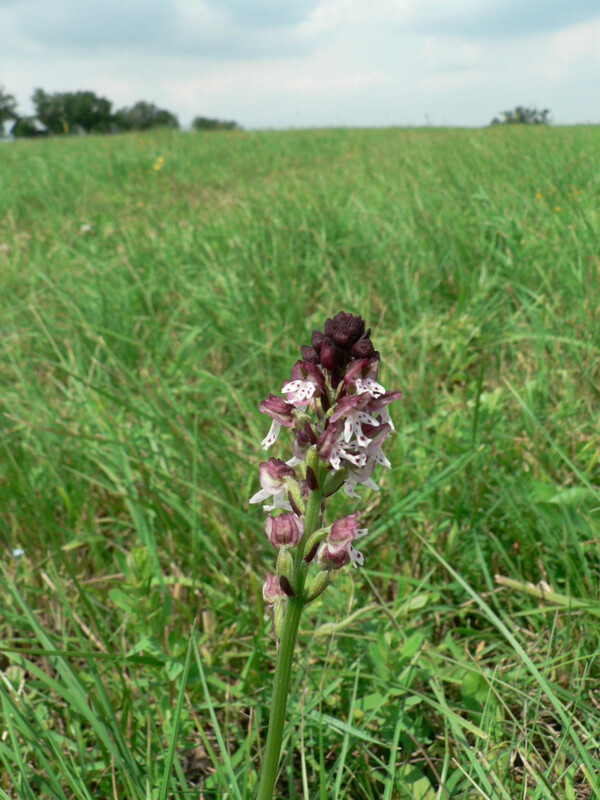 Species-rich grassland in Jazevci National Nature Reserve. Because of its diverse nature, the White Carpathian Mountains have been preserved as a Protected Landscape Area (IUCN category V) since 1980. The protected area is approximately 750 km² in size and was included in the world network of UNESCO Biosphere Reserves in 1996. A large proportion is included in the European Union’s Natura 2000 network (Jongepierová 2008). Unfortunately in the period 1950–1990 many grasslands in this area were ploughed, overfertilised or abandoned. In the past decades, however, the area of species-rich grasslands has been expanded, not only by restoration of abandoned grasslands, but also by grassland re-creation, i.e. ‘regrassing’ of ex-arable land (Jongepierová & Malenovský 2012). Since 1990, about 7,000 ha (27 sq. mi) of arable land have been converted to dry or mesic grasslands by sowing commercial grass-legume seed mixtures (the majority) and spontaneous succession (approximately 3%). Some arable land has also been sown with a regional seed mixture of dry grassland plants. To date, a total area of 2.3 sq.mi has been regrassed this way. 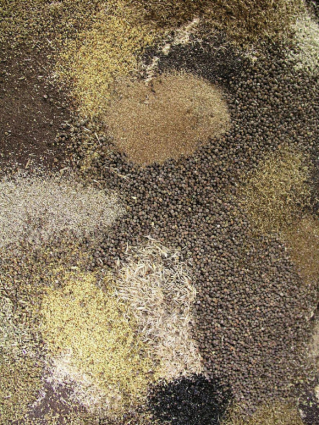 Some of the seeds, mostly herbs, are acquired by cultivation in special seedbeds. Grass seeds are obtained from existing species-rich grasslands, formerly using a combine harvester, but since 2007 with a brush-harvester. The initiative for creating this mixture was taken by the Czech Union for Nature Conservation, Local Chapter Bílé Karpaty in cooperation with the White Carpathians Protected Landscape Area Authority. The White Carpathian Mountains are the only region in the Czech Republic where a local seed mixture has been sown on a large area. 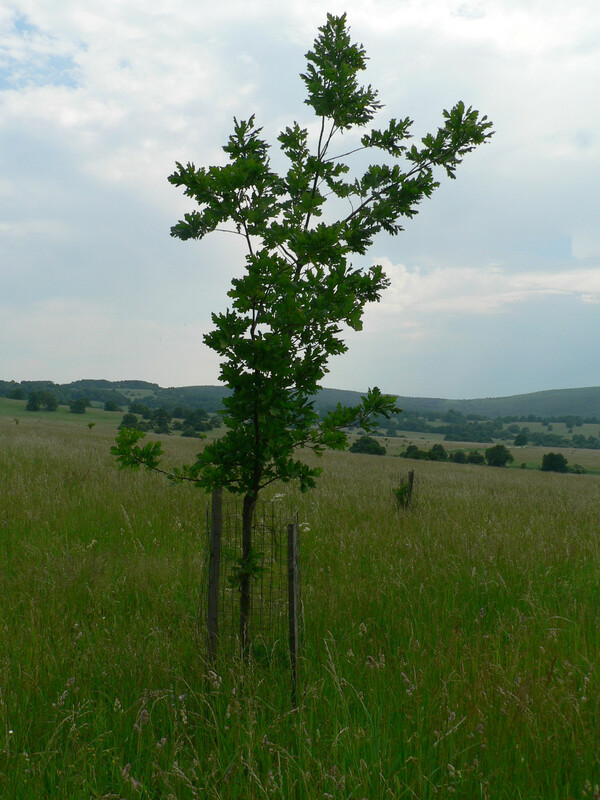 Several studies have been conducted to assess the processes of grassland re-creation. 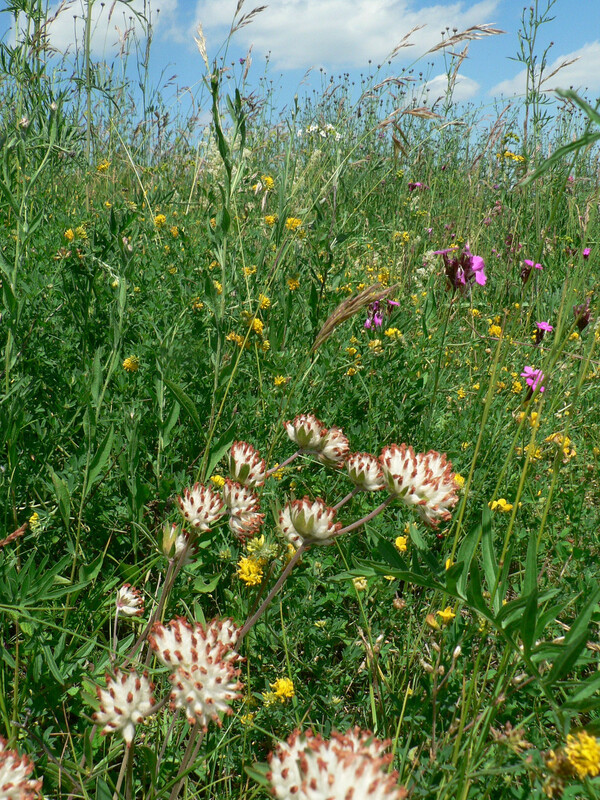 In 1999, a small-scale experiment was set up on an ex-arable field to compare different methods of re-establishing species-rich grassland vegetation. 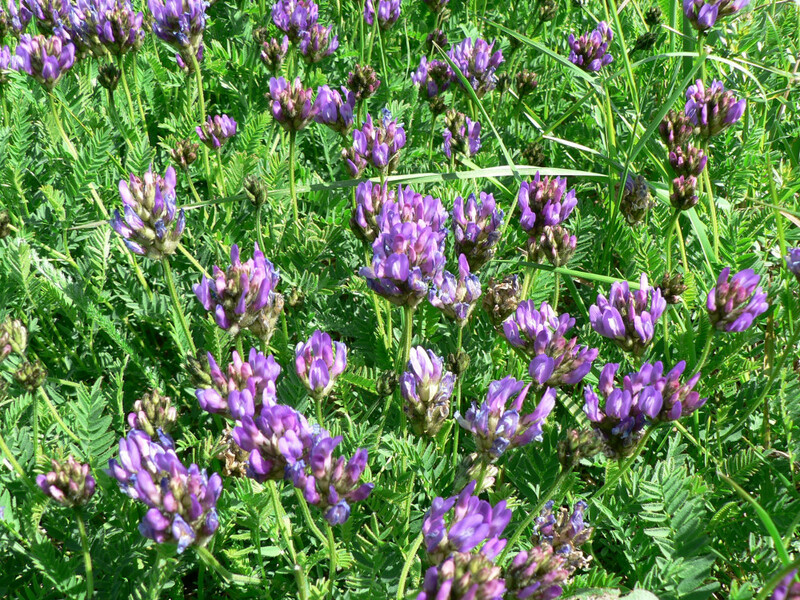 After 10 years the vegetation in experimental plots was found to gradually converge towards ancient meadow vegetation, although still remaining relatively poor in species (Jongepierová et al. 2007; Jongepierová 2008; Mitchley et al. 2012). In 2009–2014 vascular plant succession was also monitored in 80 large fields restored with a regional seed mixture, commercial seed mixtures or by means of spontaneous succession (Prach et al. 2013, 2014, 2015; Jongepierová & Prach 2014; Johanedisová et al. 2014). Results showed that the latter two lead to more mesic vegetation (Arrhenatherion elatioris), whereas dry grassland vegetation (Bromion erecti) developed after sowing regional seed mixtures. Many non-sown grassland species appeared to have colonized the fields thanks to the rich species pool occurring in the vicinity of the re-created grasslands. Besides vegetation, in 2012–2013 communities of phytophagous insects (butterflies, cicadas, leafhoppers and true bugs) were also monitored at 16 sites regrassed with a regional seed mixture and at 16 permanent grasslands for reference (Malaníková 2016). Moreover in 2014, phytophagous beetles were monitored at four sites regrassed with regional seed mixtures, four regrassed with a commercial mixture, four left to spontaneous succession and five permanent grasslands for reference (Malaníková 2016). At all these sites the development of the vegetation was monitored as well. In total 87 species of cicadas and leafhoppers, 96 true bug species, 66 leaf beetle species, 109 weevil species and 76 butterfly species were recorded at the re-created grasslands. Although many species typical of the White Carpathian grasslands were not recorded at the restored sites, some species were found to occur here in large numbers while missing in the preserved grasslands. These were not only common pioneer and ruderal species, but surprisingly also ones that prefer short xerothermic grassland, e.g. spittle bug Neophilaenus infumatus and grasshopper Tettigometra impressopunctata. However, the butterfly assemblies at restored sites were much poorer in species and numbers than those in permanent meadows. The two most common butterfly species at restored sites included Meadow Brown (Maniola jurtina) and Small Heath (Coenonympha pamphilus), which are both known to settle in species-poor grasslands. Most butterflies obviously need more time to colonize restored grasslands, but the grassland vegetation itself must also offer more nectariferous plants and a richer spatial structure (i.e. hedges, shrubs and scattered trees). The results of both botanical and zoological monitoring confirm the significance of the use of regional seed in re-creating grasslands. In order to restore them completely, however, other missing landscape elements such as solitary trees, hedges and baulks need to be added. Full grassland restoration is a question of time, since missing species need many years or decades to colonize restored grasslands from the surroundings. Johanidesová E., Fajmon K., Jongepierová I. & Prach K. (2014): Spontaneous colonization of restored dry grasslands by target species: restoration proceeds beyond sowing regional seed mixtures. Grass and Forage Science 70: 631–638. Jongepier, J.W. & Jongepierová I. (2009): The White Carpathian wild flower grassland, Czech Republic. In: P. Veen, R. Jefferson, J. de Smidt & J. van der Straaten, eds, Grasslands in Europe of high nature value, pp. 186–195. KNNV Publishing, Zeist. Jongepierová I. [ed.] (2008): Louky Bílých Karpat. Grasslands of the White Carpathian Mountains. ZO ČSOP Bílé Karpaty, Veselí nad Moravou. Jongepierová I., Mitchley J. & Tzanopoulos J. 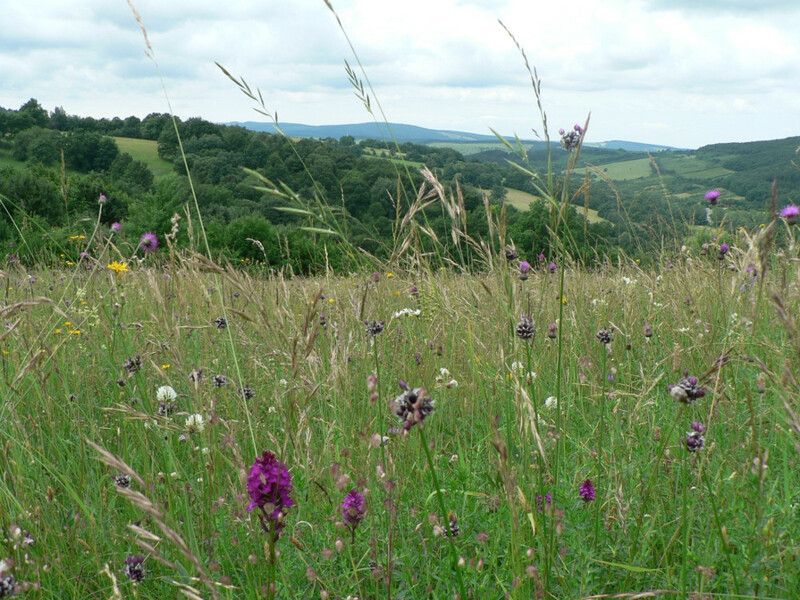 (2007): A field experiment to recreate species rich hay meadows using regional seed mixtures. Biological Conservation 139: 297–305. Jongepierová, I. & Malenovský I. (2012): Grasslands. Introduction. In: I. Jongepierová, P. Pešout & K. Prach, eds, Ecological restoration in the Czech Republic, pp. 35–38. Agentura ochrany přírody a krajiny ČR, Prague. Jongepierová I. & Prach K. (2014): Grassland restoration in the Czech Republic. In: K. Kiehl, A. Kirmer, N. Shaw & S. Tischew [eds], Guidelines for native seed production and grassland restoration, pp. 198–219. Cambridge Scholars Publishing, Newcastle upon Tyne. Jongepierová I., Prach K., Fajmon K., Malaníková E., Malenovský I. & Spitzer L. (2017): Obnova druhově bohatých luk v Bílých Karpatech. In: I. Jongepierová, P. Pešout & K. Prach, eds, Ecological restoration in the Czech Republic 2, pp. 35–38. Agentura ochrany přírody a krajiny ČR, Prague. Malaníková E. (2016): Obnova druhově bohatých travních porostů v Bílých Karpatech z hlediska fytofágního hmyzu. Ms., thesis. Masarykova univerzita, Přírodovědecká fakulta, Ústav botaniky a zoologie, Brno. Mitchley J., Jongepierová I. & Fajmon K. (2012): The use of regional seed mixtures for the recreation of species-rich meadows in the White Carpathian Mountains: results of a ten-year experiment. Applied Vegetation Science 15: 253–263. Prach K., Jongepierová I. & Řehounková K. (2013): Large-scale restoration of dry grasslands on ex-arable land using a regional seed mixture: establishment of target species. 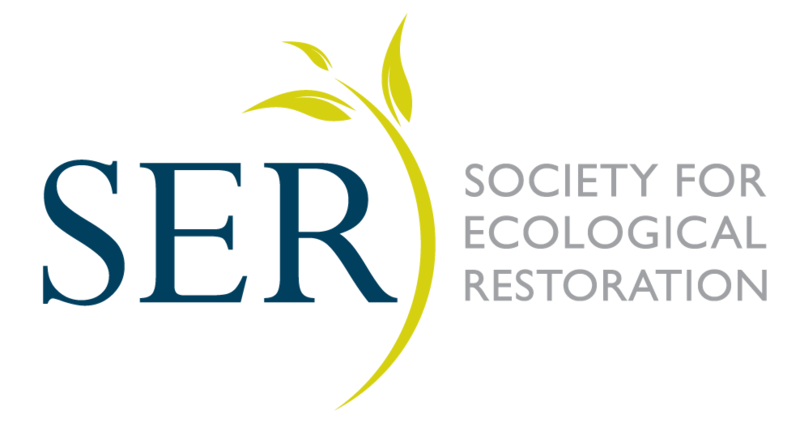 Restoration Ecology 21: 33–39. Prach K., Jongepierová I., Řehounková K. & Fajmon K. (2014): Restoration of grasslands on ex-arable land using regional and commercial seed mixtures and spontaneous succession: Successional trajectories and changes in species richness. Agriculture, Ecosystems and Environment 182: 131–136. Prach K., Fajmon K., Jongepierová I. & Řehounková K. (2015): Landscape context in colonization of restored dry grasslands by target species. Applied Vegetation Science 18: 181–189. Wilson, J.B., Peet R.K., Dengler J. & Pärtel M. (2012): Plant species richness: the world records. Journal of Vegetation Science 23: 796–802.